Remember Bruce Lee … the international action super star of 80’s who entertained generations and still does with his films on TV channels and YouTube . Now a film is been launched with an actor who looks exactly like Bruce Lee is all set to roll . 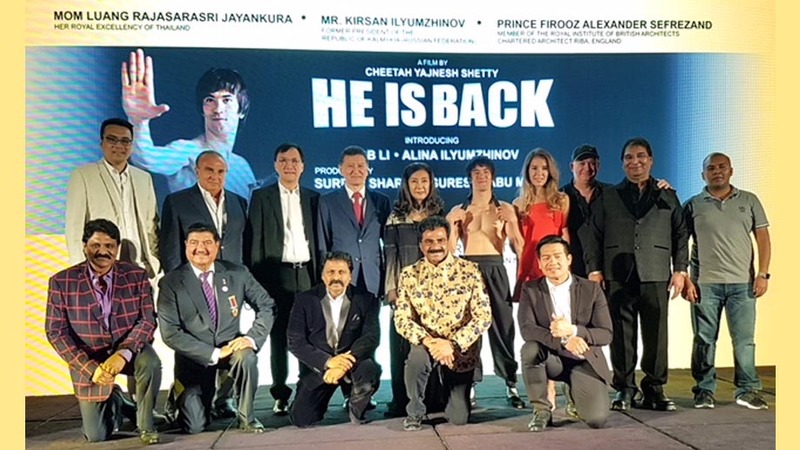 The film called ‘He is Back ‘ will revisit the good old evergreen action mania of Bruce Lee though in contemporary times . The film is a joint venture of 5 countries including India , China , Russia and Thailand .. The film will introduce Abby Li who looks like Bruce Lee and dances like Tiger Shroff . The film was Launched at Armani Burj Khalifa in Dubai with a grand mahurat . The film will be shot majorly in Russia and China and will release next year ..
Showtimes Cinema and SBM Studios in Association with Ninjoor Pictures is all set to roll out their ambitious international venture – He Is Back!Produced by Suresh Sharma who last produced the gritty drama Halla Bol and Suresh Babu Malge who also produced many movies and directed by Cheetah Yajnesh Shetty who helmed Hum Tumpe Marte Hain. He Is Back was launched in Dubai where who’s who of the world were present. The movie was inaugurated with the lamp lighting by Her Royal Excellency Of Thailand Mom Luang Rajadarasri Jayankura , Mr.Kirsan Ilyumzhinov, Former President of the Republic of Kalmykia in the Russian Federation and Prince Firooz Alexander Sefre, Member of the Royal Institute of British Architects Chartered Architect Riba, England.Other eminent guest were Edmond Avakian, Thomas Fung, Fatemah Hossain Zamani and Lazar Jakovljevic. Inspired by Bruce Lee, the movie revolves around the theme of how a poor boy changes the world! The film introduces Abb Li in the lead role who happens to be a big worshiper of Bruce Lee. It is learnt that Abb Li is such a loyal follower of Bruce Lee that he has transformed his body also to Bruce Lee style. The movie also introduces actress Aline Ilyumzhinov in the lead role along with an ensemble cast of Hollywood biggies! Story by chitah yajnesh and sound by Resul Pukutty, the film has been screenplay and dialogue by David White and involves big international names in the movie making business including DOP Ross Clarkson and world renowned action director Kecha Khampakdee. Rockline venkatesh gave the clap and Dr B R Shetty, Abu Dhabhi switched on the camera. AmarjIt Shetty is co producer of the film and William Bond is Executive Producer.